Specialising in lifecasting babies & children, adults & families and pets. Wear jewellery created with Fingerprints, Handprints, Footprints & Pet Paws. Helping you to capture final memories. Make an impression in ceramics & kiln fired clay. Perfect for babies, children, adults, families...capturing a moment in time. or by making a booking at Impressive Memories studio. GG was 11 days old when we had the castings done. A week later we were in hospital for the start of his special needs journey. His casts are a little reminder of how far we have come. Something you think is just a keepsake has become so much more. My gran passed away suddenly. I'm the only granddaughter & we never got a picture of the 4 generations together. My necklace represents this with my gran, mum, myself and my daughter's fingerprints. It's beautiful and I wear it all the time. 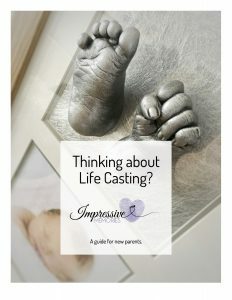 Are you a NEW PARENT & thinking about booking a baby lifecasting appointment? Find all the answers to the questions new parents ask me about lifecasting their babies and children. Hello, I'm Jen - owner & creator of all things Impressive here at Impressive Memories! (My furry companion is Farrah the cockapoo). Welcome to Impressive Memories Head Quarters. The purpose built studio has off-street parking outside & a warm & cosy welcome inside.